Members are treated to several member-exclusive benefits, not to mention member-exclusive discounts on our wines, Tasting Room merchandise purchases and private events at our Winery. Our family takes pride in making some of the best wines in Sonoma from grapes grown in the Carneros appellation. Now remember… we honor the tradition of not distributing our wines to stores just so you and your friends can enjoy a unique, exclusive product. We hope you agree that the Carneros Club is a great way for our family to share these award-winning wines with you, our loyal customers, on a regular basis. • Three (3) bottles will be shipped to you four (4) times per year at a 20% discount. • Shipments may include current wines, new releases, library releases, or club member-exclusive wines. • The amount of your package will range in price from $70 to $90 (before taxes & shipping). • Sales tax will be applied where applicable. • Your credit card will be billed before each shipment. • Members may request to pick up their wines at the winery (within 30 days) or be shipped to their doorstep. • Fees will apply to all shipping changes and returns. • COMPLIMENTARY four (4) glasses of non-reserve wine every three (3) months. • If you don’t like a wine we’re shipping you, just tell us which one in the shipment you’d like in its place and we’ll substitute it! 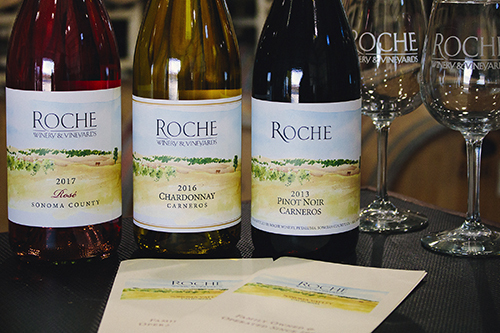 • COMPLIMENTARY Member tasting for you and up to three (3) guests in our Tasting Room anytime!